This could be one of the easiest summer dinners to pull together at the last-minute, especially if there is leftover chicken breast in the fridge. A store-bought rotisserie is another option if simplicity is goal. However, there have been plenty of occasions when we simply grill a few chicken breasts in lieu of waiting for leftovers. Regardless of how the chicken is made, with very few ingredients needed, this is a great dinner the whole family will enjoy. It has become one of our favorites. With a fork, shred the chicken into bite size pieces. Some pieces will be bigger than the others. It is not necessary to have the chicken completely shredded. Melt the butter in a medium skillet over medium heat. Add the wing sauce and chicken and cook, stirring occasionally, until heated through, 2 to 4 minutes. Toast the buns and divide the chicken evenly over the bottom of the 4 buns. Sprinkle with a good portion of blue cheese. Top with a couple leaves of lettuce. Mayonnaise can be used on the bun if preferred. Top with bun and serve. 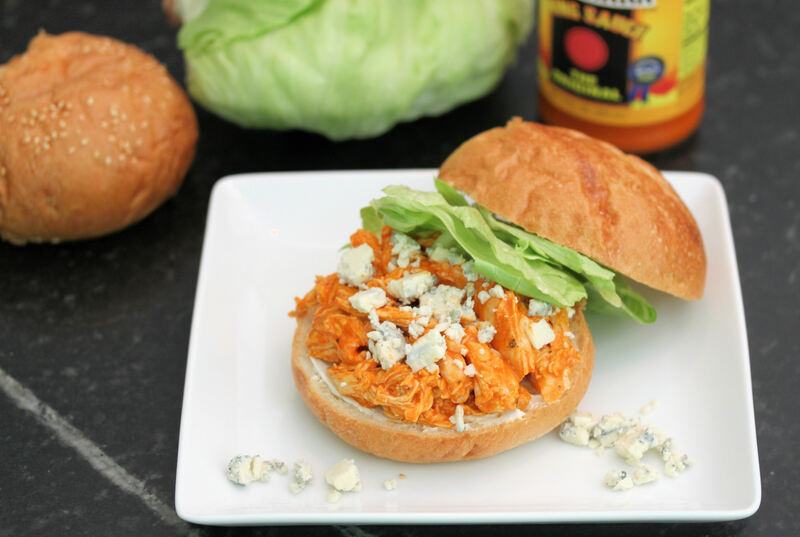 This entry was posted in healthy options, leftovers, main course and dinner and tagged blue cheese, buffalo chicken sandwiches, buffalo wings, chicken, dinner, grill recipes, grilling, leftovers, louisianna wing sauce, lunch, sandwiches. Bookmark the permalink.